In 1999, Edward Moshole was a cleaner with just R68 in his pocket, but he noticed a business opportunity. Good quality detergents and disinfectants could make a tough cleaning job much easier, so he started buying quality products in bulk and selling them to his fellow cleaners. He wasn’t satisfied, though. He wanted a business that made and sold its own products. So, he tackled the long and arduous process of creating cleaners and detergents that could pass strict regulations and compete with the best products on the market. It wasn’t easy, but he kept at it. In fact, he only got his first real breakthrough in 2006 when a supermarket agreed to start stocking his products. 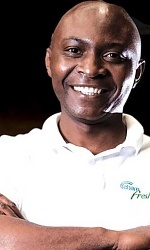 Today, his Chem-Fresh products can be found all over Africa, and he counts Pick n Pay as one of his main clients. How did Moshole manage to turn R68 into an empire? Here are his rules for building a large and sustainable operation. “Very early on, I identified Pick n Pay as a must-have client. I could see that the company was changing its strategy — it was starting to move into townships and rural areas, places where it hadn’t been operating until then — and I thought it would be the perfect place to sell Chem-Fresh products,” says Moshole. But getting in wasn’t easy. “As a small business, you don’t get to sit down with decision-makers. Becoming a supplier to a large retailer is a difficult process. It took me years to get a foot in the door, but I didn’t give up. I just knew that Pick n Pay was the right company to do business with, so I kept at it. I refused to take no for an answer. Today, Pick n Pay operates more like a partner than a client. When starting out, entrepreneurs often have little choice but to buy other companies’ products and resell them. It’s not necessarily a bad thing — it can be a successful strategy. However, it can eventually limit your growth. Firstly, buying and reselling products places a cap on your margins. When you own the manufacturing process, you can increase your margins, since making and selling products tends to offer wider margins than merely buying and reselling. That said, you have to keep in mind that this is only true when you operate at a certain scale. Making and selling something in small quantities can often be more expensive and time consuming than simply buying it from a supplier. You need to crunch the numbers and make sure that the expense of a manufacturing facility is actually worth it in the long run. Secondly, it allows you to keep control of the quality of your product. “The secret to any great brand is consistency,” says Moshole. Some companies can grow while sticking to a very specific niche, but most have no other option but to diversify. Although Chem-Fresh started out selling just one or two products, Moshole soon started to expand the range. The company now has more than 100 products. “Generally speaking, you can only capture so much of a market. Sometimes it makes sense to actively try to grow your market share, but it’s also a good idea to diversify. Not only does this open more revenue streams, but it also protects the business against market changes. So, if the sales of one product slows down, another speeds up and everything evens out,” says Moshole. But the important thing is not to stray too far from your comfort zone. Chem-Fresh now has a large product range, but it has stuck to an industry that it is knowledgeable about. The company has built a name for itself within a specific industry. “Don’t wait too long to start thinking about the long-term life of your business,” advises Moshole. “The stronger the foundation of the business, the easier it is to grow it, so you need to implement the right systems and processes early on. If you don’t, the business will fall apart without you. “You will always be very involved at an operational level. You’ll be so busy with the daily grind, that you’ll never be able to take a strategic view and focus on building the company. It took Edward years to get his product onto Pick n Pay’s shelves, but he wouldn’t take no for an answer. Today, the relationship is more like a partnership. In the right quantities, producing and selling your own product can significantly increase your margins over selling someone else’s products. Diversifying your product range within your niche allows you to offer the same clients a greater range, tap into new markets, and protect the business against market changes. Take a long-term view when contemplating the growth of your company. It’s never too soon to prepare a business for growth. Implementing the right systems and processes right now can make it much easier to scale the operation down the line.